Coconut oil is a fantastic substitute for butter or shortening in baked goods, but its mild tropical flavor can also enhance greens, grains, vegetables and even shrimp. Here, six ways to use the popular oil. 1. Breakfast. Instead of sugar, swirl the naturally sweet oil into your oatmeal. Or highlight oats’ sweetness by using coconut oil in your favorite granola recipe. 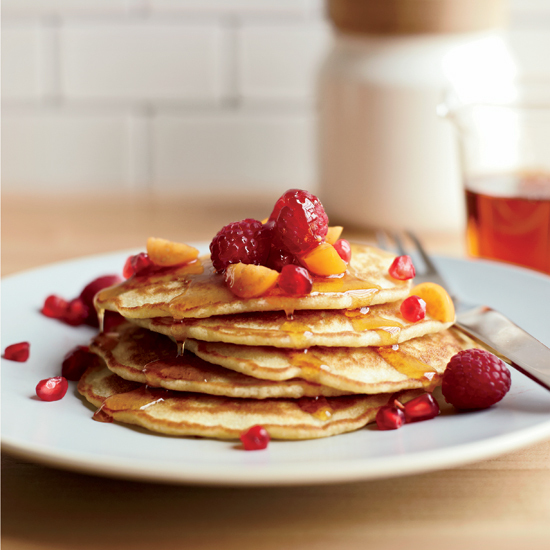 Add melted coconut oil to pancake batter (as in this healthy gluten-free recipe) and use it to grease the griddle. 2. Sweets. Coconut oil makes a great butter substitute when making both cake and frosting. Try these fantastic chocolate cupcakes. It also makes fantastic Rice Krispies treats. 3. Vegetables. Sauté greens, like kale, Swiss chard or spinach in the oil; its richness mellows their astringent flavor. Or melt the oil and toss it with sturdy vegetables like sweet potatoes, squash and cauliflower before roasting; the oil will enhance the caramelized flavor. 4. Grains. Stir coconut oil into any grain dish, like a cauliflower-flecked quinoa and lentil pilaf. The oil’s lightly sweet flavor is also great with plain brown rice. 5. Popcorn. Use it in place of butter or any other oil for popping corn; it’s especially great in this spicy black pepper kettle corn. 6. Shrimp. Make a tropical take on shrimp scampi using coconut oil in place of the butter and lime instead of lemon.